The last time the Red Sox won three in a row was April 9, 10, and 11. The last time they were at .500 was May 2. The Sox are 4-6 in their last 10, 9-11 in their last 20, and 12-18 in their last 30 games. In other words, a very mediocre team. 1. Thanks to the young fan Ethan, who autographed his bat, Mike Napoli hit four homers in the series against the Los Angeles Angels, which gives him six home homers the most for the Sox this season. Mookie Betts and Hanley Ramirez each have hit four at Fenway, next on the club. 2. Right field remains an offensive disaster area for the Sox. In the American League, right fielders are hitting .265, while the Sox right fielders are hitting .167, the lowest batting average in the majors. The average MLB OBP is .331 for right fielders, but the Sox have just a .256 OBP. Shane Victorino and Allen Craig have hit the only two homers from the right fielder slot. 3. The last Red Sox player 25 years old or under to hit 20-plus homers is Nomar Garciaparra. Nomar hit 27 home runs in 1999 at age 25, 35 homers in 1998 at age 24, and 30 dingers in 1997 at age 23. 4. According to ESPN Stats & Information research, over the past five years, teams that score five or more runs in the first inning win 86 percent of the time (155-24). This season, the Sox have scored a total of 14 runs in the first inning, the most being four, which they did once. They’ve scored three runs once, two runs once, and one run on eight occasions. Only the Chicago White Sox with 13 and New York Mets with 12 runs have scored fewer first-inning runs. 5. 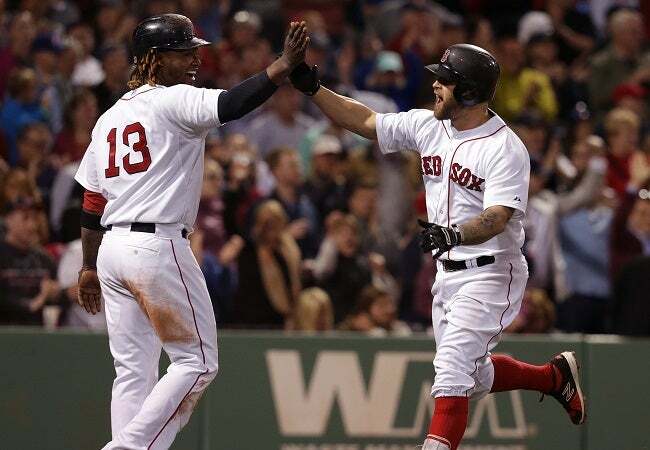 Like the New York Yankees, Seattle Mariners, and the Milwaukee Brewers, the Red Sox have gotten 10-plus hits in 13 games, tied for the 20th most in the majors. While Seattle and Milwaukee are 8-5 in these games, the Yankees are 10-3 and the Sox are 11-2. The San Francisco Giants are 19-6 when getting 10-plus hits, and their 25 games are the most in the majors. 6. David Ortiz is hitting .221. The only time Big Papi had a lower BA through his team’s first 44 games was in 2009 when he was hitting .195; he finished that season with a .238 average. 7. In May, Sox starting pitchers have a 4.67 ERA and a 1.400 WHIP. The Sox bullpen has a 2.88 ERA and a 1.311 WHIP. 8. When Sandy Leon has been behind the plate, batters have hit .242 against his pitchers; when Ryan Hanigan has been catching, batters have hit .251 against his pitchers; and when Blake Swihart has been catching, batters have hit .283 against his pitchers. 9. The only time the Red Sox have made the postseason when they were .500 or worse at the 50-game mark was in 1988, when they were 25-25 and finished as division champs in first place with a record of 89-73.